Like many of you, I tend to let TV series play themselves out completely before I allow myself to get hooked. What's the point in watching something if it just gets cancelled after two episodes? Also, there's a particular aversion to watching a nostalgic fantasy novel get ruined, which is probably why I avoided watching "The Shannara Chronicles" until recently. I remember reading the first Shannara book, "The Sword of Shannara," when I was in about 5th grade. At the time, reading a 600 page volume was a tremendous achievement, and I've always had a kind of affection for the book. It's basically "LOTR Lite" as the plot follows Tolkien's classic almost to the point of being an embarrassment (you can read more about the similarities in this great article on Black Gate). There was a time when I would have exploded with joy at the idea of a mini-series being made of Brooks's work. However, when news first broke about MTV's project, I could only manage a feeble, "meh." Now that I'm in my 40s, it's pretty clear that there are better works of fantasy out there which are far more deserving of being shared with a wider audience (like the Sacred Band books). What's my verdict on these? Well, of course they aren't great, but hey, it's got decent production value and it's a fantasy series, so why not? I'm up to about episode 6 and I have to say that I've enjoyed spending the last week burning through one or two of these a night. Sure, there have been a couple cringe-worthy moments, but there is always a higher possibility of that in fantasy adaptations (you find them in Peter Jackson...what makes you think they won't be present in MTV?). I think my biggest gripe is with the "Twilight" inspired love triangle...not the triangle itself but the way it's presented and acted in a kind of "Twilight" way. But then again, heck, I watched "Twilight" too because it had werewolves and vampires in it, so yeah, I'll watch! It seems lately that some upcoming releases get caught up in a spiral of "internet boycott." For example, a lot of people have already decided that "Superman V. Batman" is going to be bad, so you see a lot of articles written from the perspective that this is a foregone conclusion. The same was true about the most recent Fantastic 4 movie, and although that movie was bad, it wasn't any worse than any number of other bad movies that have gone on to gross obscene amounts of money (I'll be intentionally vague about what other films I'm referring to because I don't want to get off on a tangent...but there are some widely loved movies that are absolutely TERRIBLE). I think people get mad about the fact that one subject matter gets a film and another is passed over, but stubbornly avoiding certain shows isn't going to ensure your pet project gets made. If you want to see a film version of "The Sacred Band" or "The Reader of Acheron" you, as a lover of fantasy, have to do what you can to make sure "Shannara" gets a fair shot. The studio executives who make these things can't recognize quality, but what they can recognize is profit. If they become convinced that there is large profit to be found in Fantasy, then they'll acquire more properties and make more programs. If "Shannara" tanks...good luck getting the next fantasy series made. Now, look, I'm not saying you have to like it. But watch the first two episodes free, then put your comments either here, on Facebook, twitter, or your personal blog. Get some buzz, good or bad, and let the executives know what you'd like to see done better. But don't just get angry and decide you hate it without giving the series a chance. I'll probably revisit this again after I've watched all of season 1. My short review is that I'm happy it exists and I hope MTV comes back with a season 2 treatment of The Wishsong of Shannara. 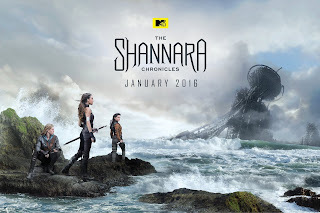 Based on the fact that they call the series "The Chronicles of Shannara," I assume they started with some sort of plan to continue with more of the books. Also, I have to admit, my dystopian fantasy "The Reader of Acheron," also set in the crumbling ruins of a future Earth, probably owes something of a debt to "Shannara." It's good that fantasy of high production value exists. Given another season, the writers working on "Shannara" might start creating a truly noteworthy series. I hope it happens.